Meet the REAL DEAL. Kyle Peterson, Age 5, is a True Hero. I don’t cry through a lot of news stories. And that’s not because I’m insensitive. It’s just the opposite, in fact. I’m so sensitive that if I started crying, I’d never stop. That’s why so many times, I try to hold it together. But I couldn’t do that for this story. Nor did I expect to. Five-year-old Kyle Peterson is a hero in every way. Not only is Kyle in remission from AML, an aggressive form of leukemia, but his DNA is now being used for research around the world. All of that, and he is an amazing kid who smiles, laughs and plays constantly. How do I know? He’s the son of my bff Kim Boggs Peterson. Kim and I have been friends since high school, when our antics — whether at band camp or the local movie theatre — sometimes got us into trouble. We walk a straighter line now, choosing to take our kids to the pool or the Ypsilanti Firehouse Museum over teenage trouble-making. We’ve always had a lot of fun together. But now there’s a whole different level to our friendship. We connect not just as long-time friends whose kids splash each other in the pool and run through the house shooting Nerf guns, but as people who know what it’s like to face life-threatening diseases — and to rally for their cures. Kim and her family — husband David, sons Karl and Kyle — are some of the bravest, most inspiring people you’ll ever meet. Then, consider joining us at the Light the Night Walk in Ann Arbor on October 8, where Kyle will be one of the honored heroes. Don, Theo and I will be there. Theo will have the honor of carrying a lighted balloon in honor of his friend Kyle. You can sign up to walk on Kyle’s team at http://www.lightthenight.org/register. Look for Kim Peterson’s team, Kyles Korner, or register to walk as an individual. It’s amazing, truly, to stop and think about what Kyle has already achieved in his young life. At the age of five, he’s beaten a fierce opponent and contributed to the world in a way that is beyond measure by allowing scientists to study his DNA in order to help find a cure. All of that, and he’s got a whole lifetime ahead of him. Amen to that. This Yellow Powder Shows Promise — And I’m All Over It! Turmeric: A powerful spice that shows promise in both preventing and treating cancer. Photo by Amy Rauch Neilson. It’s a pungent yellow powder. You can buy it at just about any grocery store. It’s been around for thousands of years. And it’s cheap. The bottle I bought two months ago was $5.99, and there’s perhaps still a quarter of it left. I use it every single day without fail. 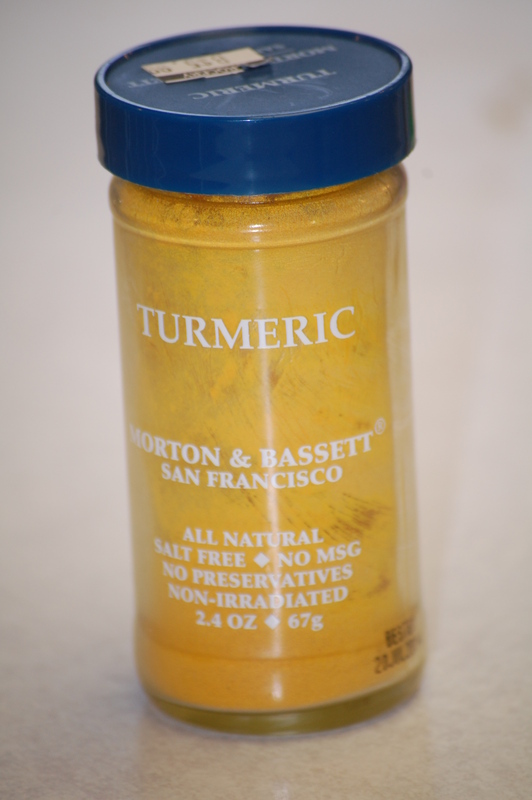 It’s a spice called Turmeric and it’s been used liberally in Indian cuisine for milleniums. I consider it a miracle in both the prevention and treatment of cancer. And I’m in good company. My close friend Scott Orwig, who is a prostate cancer survivor, turned me on to this powerful spice a few months ago. He and I trade recipes and articles on the latest developments in cancer treatments like two kids with a stack of baseball cards. Over the weekend, he forwarded me an article straight from the research laboratory at the world’s most renowned cancer institute: M.D. Anderson in Houston, Texas. That’s where researcher Bharat Aggarwal has been studying the medicinal use of spices, like the turmeric he grew up eating in his native India. Much of his research has focused on curcumin, a substance used to make turmeric and a chief ingredient in curry sauces. Turmeric has already proven itself in studies several times over — and it continues to do so. “There were at least a half a dozen clinical trials that appeared last year alone on curcumin, where as little as 100 milligrams is enough to down modulate all the inflammatory biomarkers in people,” Aggarwal said. Yes, people. We are not talking about animal trials that have not yet reached the testing stage on humans. We are already there. I’ve never been particularly fond of Indian cuisine, so until recently, Indian spices haven’t been a part of my regular diet. But they are now — particularly Turmeric. I eat it every single day, 1/2 teaspoon mixed with black pepper and thrown into a bowl of very healthy minestrone soup. (In order to be assimilated by the body, turmeric must be mixed with black pepper). I’m not saying that any single spice is a cancer cure-all. But I do believe in the philosophy offered in the international bestseller, Anti-Cancer: A New Way of Life, by David Servan-Schreiber, M.D., Ph. D. We need to take a multi-faceted approach to cancer treatment — which includes the most effective chemotherapy paired with the best spices, foods and supplements nature has to offer. Schreiber outlines just how to do that and I’m on it. I’ve already made major changes in my diet in the past two months, and will continue to do so. I cannot and would not point to any one thing that I or my doctors have been doing since my January 2011 Stage 4 breast cancer diagnosis as the “miracle.” But I can say that I’ve been dedicated to using every available tool out there to bring myself closer and closer to remission — be it chemotherapy, trial drugs like the PARP Inhibitor, foods, spices and supplements. And something — perhaps all of it, together — is working. My most recent scans were the most dramatic, showing shrinkage of some of my tumors by 3 or 4 millimeters — in just six weeks’ time. That’s a major victory. I also feel dramatically different in the last few months. And time and again, people who have not seen me for two or three months remark that my skin is glowing. I look healthy, not pasty like I did following my diagnosis. I continue to read everything I can get my hands on in relations to cancer fighting foods, spices and supplements. I also listen to every expert out there. That’s what I’ll be doing this weekend, when I will be attending The Pink Fund Annual Luncheon. Keynote Speaker Kris Carr, New York Times best-selling author and Stage 4 cancer survivor, will be talking about how she radically changed her diet to save her own life — and how all of us can follow her lead in living longer, healthier lives, preventing cancer, and fighting it, if that is among the cards we are dealt. There are still a few tickets left for Saturday’s event. If your debate is over the ticket price, keep in mind what someone once told me: You can either learn how to take good care of yourself right now and buy and prepare better quality — and likely more costly — foods, or you can pay it out in medical bills later. Today was the fourth infusion of my typical two-week chemotherapy cycle — two weeks on, one week off. I have lost count of what # chemo round this was. So many infusions since I started chemo back on Feb. 1. So many chemicals that just make me so sick. This was one of the more difficult weeks for me to tolerate physically, and I’m just glad it is over with. I’m now off until the next round begins Oct. 4. I have three Neopogen shots to get through in the next three days, so I’ll need to manage the bone pain that comes along with them. But I will. I’ve done it before. I’ll do it again. Off to bed to sleep the worst part of this day off. Looking forward to many Happy Squares between now and the next round — including a day-long school field trip to a local apple orchard with Theo, who is snuggled in next to me right now and snoring softly. I won’t be far behind him. As my Dad used to say, “Things always look better in the morning, after a good night’s sleep.” Amen to that. I’m still pretty wiped out from last weekend’s festivities a la Bras for a Cause Benefit 2011 Saturday night. Between that, which was sandwiched between chemo (this week is the second week of the current round), I’m only moving at say, half my normal warp speed. And while you are there, please do me a favor and hit the “like” button on that page. That would help my efforts to get the word out about my blog and this cause tremendously! Bras for a Cause 2011 was the fabulous evening all of us hoped and dreamed it would be. There was a full house at the Royal Oak Music Theatre. Twenty-six models — all breast cancer survivors — strutted their stuff — including yours truly. Dave Coulier emceed the event, introducing the models, heading up the Live Auction. There was also an incredible strolling dinner, Silent Auction, raffle, and more than 80 Art Bras on display. This year, I had the honor of serving on the Bras for a Cause Committee for the first time. As such, I was invited to speak as the event got underway. My hubby captured my three-plus minutes of fame on our flip video. I was blessed with about two dozen friends and family members out there in the audience, supporting me and cheering me on. For those of you who could not attend, check out the video and find out what I had to say…(though I’m told I’ve never in my life been short on words). Next up: Video of my strut down the catwalk. 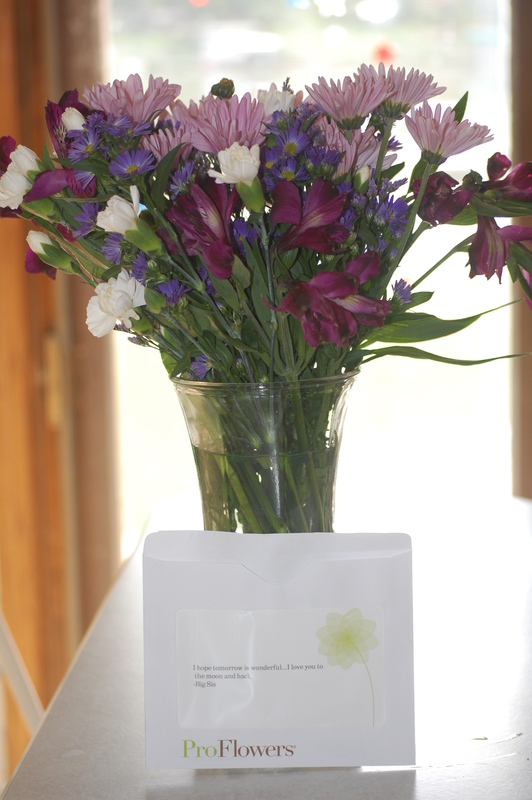 The bouquet of flowers that arrived this afternoon from my sister, Julie, who lives in Houston. The card reads: "I hope tomorrow is wonderful...I love you to the Moon and Back. Big Sis." After my earlier post featuring my glittery, Dorothy-style high heels for tomorrow’s catwalk, I couldn’t resist doing what some of you warned me not to. I put the shoes on, squeezed my eyes shut, and tapped my heels together three times. When I opened them, I was not in Kansas (thank God). But moments later, the doorbell rang. It was Fed-Ex. I didn’t order anything Fed-Ex I thought to myself as the truck pulled away and I brought the box into the house. I didn’t. But my Big Sis Julie did. That long, slender box on my front porch was a bouquet of beautiful flowers with a note enclosed from my Big Sis, sending me her magic over the miles. A bouquet of flowers for the performance. Enchanting. That we do, Rachel. That we do. Serendipitous. Finally, at the 11th hour, a pair of tickets fell into my hands from the big heart of another Committee Member, Alex Shupe. These tickets will allow two beautiful ladies to attend tomorrow evening — one of them 88 years young and a five-year breast cancer survivor. Alex, I can’t thank you enough. Magical. My advice? Go find your glitziest pair of shoes, put them on, and tap your heels together three times. Who knows what might happen? But don’t be scared. I’ve already blazed this path. Shoes by Jennifer Bopp Stegbauer -- Photo by Amy Rauch Neilson! Tomorrow is the Big Day. Bras for a Cause 2011, 6 – 10 p.m. at the Royal Oak Music Theatre in Royal Oak, Mich. I’m very excited to model the black leather bra I created — with a LOT of help from Diane and Matt Baldwin — to a song from the musical Grease. My bff Jennifer Bopp Stegbauer, in from Germany, and I went to work yesterday morning. 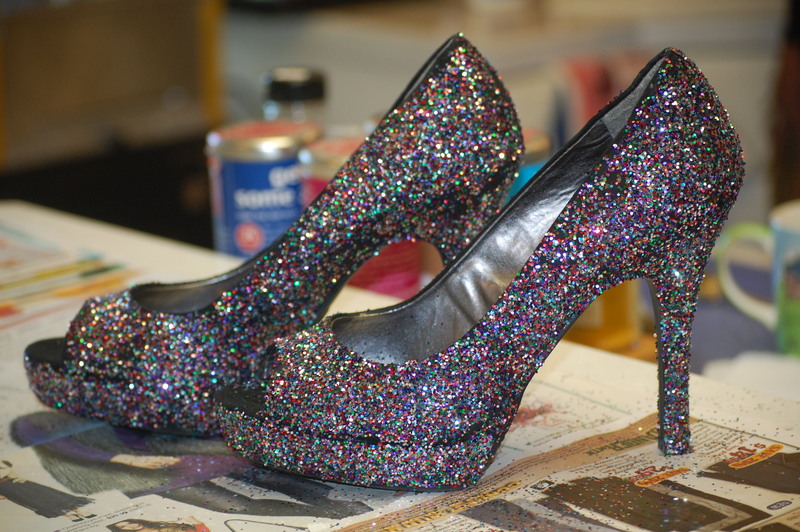 We took those plain black shoes, covered them in Elmer’s Glue, and dusted them liberally with multi-colored glitter. They are totally transformed, and I can’t wait to see how they look under the bright lights of the stage. What fun! A little bit of pixie dust and magic can go a long way. Wonder what would happen if I clicked my heels together? Do I dare to find out? and will also be sold at the door. 100 percent of proceeds go to Gilda’s Club of Metro Detroit.